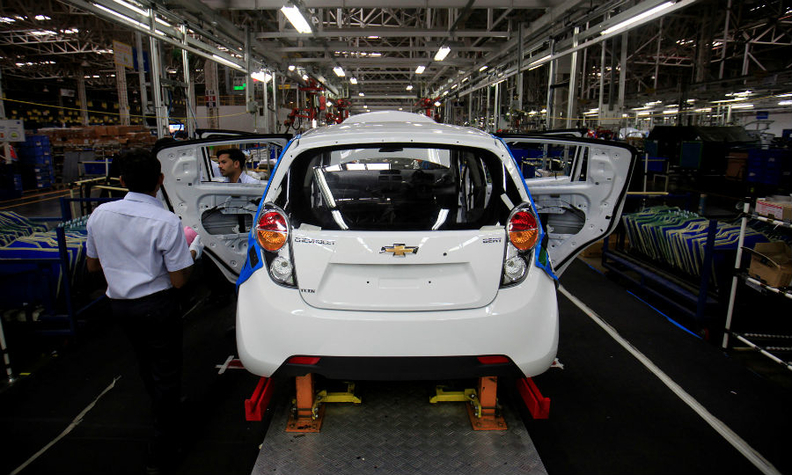 Employees work on a Chevrolet Beat car on an assembly line at GM's plant in Talegaon. BEIJING -- General Motors will stop selling cars in India from the end of this year, drawing a line under two decades of battling in one of the world's most competitive markets where it has less than a one percent share of passenger car sales. It plans to keep operating its tech center in Bangalore and to refocus its India manufacturing operations by making one of its two assembly plants in India – the one at Talegaon, about 100 km (62 miles) southeast of Mumbai – into an export-only factory. It plans to sell the Halol plant in the western Gujarat state to Chinese joint venture partner SAIC Motor. Dan Ammann, GM’s global president, said the restructuring actions for India announced on Thursday in essence cancels "most" of the plan GM unveiled in 2015 to invest $1 billion in India to deploy newly-designed vehicle architecture as part of a Global Emerging Market vehicle program or GEM for short, and build a new line of low-cost vehicles in India. Last year, Ford Motor shelved plans to produce a new compact car family designed mainly for emerging markets. India and China had been slated to be the main manufacturing hubs for the new range that was set to begin production in 2018. GM plans to continue to work on the $5 billion GEM program, which GM is developing with SAIC Motor. Ammann said the program remains on track, even without India now, to account for about 2 million vehicles a year in global sales volume, mainly in Latin America, Mexico and China.